MARTELL, founded in 1715, has always had close links to food and developed its culture of flavour and defined the base for the perfect Martell gastronomy. Out of this culture and passion, Pure Gourmet was born, derived from Martell’s philosophy in creating Cognac by the purest means – from its precise choice of curs (vineyard), eaux-de-vie filtered of lees (the process), distillation of clear wines only, then the ageing process in fine-grain oak barrels. Martell Pure Gourmet emphasises quality ingredients as the principal characteristic that defines its unique gastronomic experience. 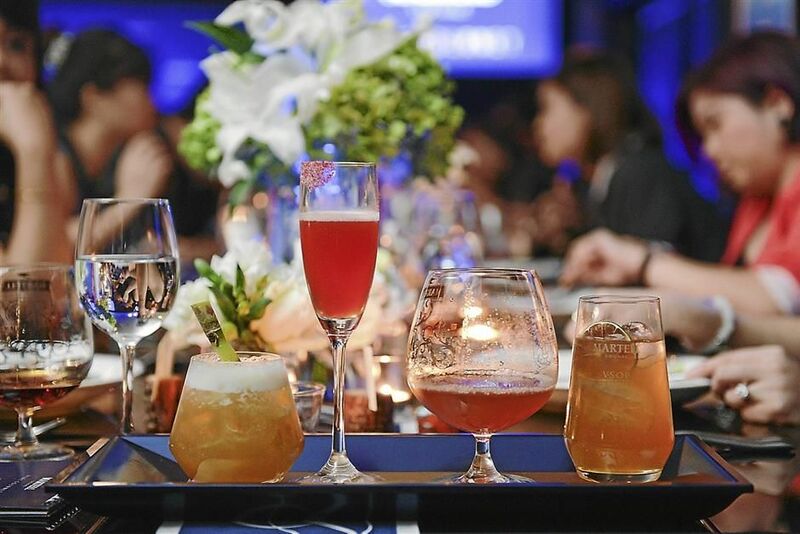 The sixth edition of its series was presented to special guests on Oct 29, which featured ingredient-led cuisine paired with Martell’s SOP, Cordon Bleu, XO, Chanteloup Perspective and Creation Grand Extra. Using only the finest quality produce that enhances the overall flavour and texture of a dish, Martell Pure Gourmet embodies the method of cooking inspired by the creation of its Cognac. Held at J.W Marriott Hotel Kuala Lumpur, the dinner showcased cutting-edge culinary techniques by one of the rising chefs of Asia, chef Ryan Clift of world-acclaimed Tippling Club in Singapore. Chef Ryan crafted a menu highlighting unique culinary techniques such as enzyme separation, vacuum distillation and sound homogenisation. “Techniques shape the culinary world as much as ingredients and are equally as important as selecting fresh and the finest ingredients,” Pernod Ricard Malaysia managing director Terence Ong said. Each dinner event has focused on different hallmarks of unique experience: ingredients and origins, senses, craftsmanship, heritage and now, technique. “Over the years, Pure Gourmet in Malaysia has evolved with every edition. These hallmarks not only apply to crafting their dinners but the Cognac as well,” Ong added. The dinner began with a dish made using a salt curing and enzyme separation technique. From it, a meal made out of Coffee Cured Ocean Trout, Apple Puree, Sorbet, Horseradish, bronze fennel and dill flowers was presented. It was paired with Cordon Bleu, a rich in the mouth explosion of fruity and spicy notes. The second meal was my favourite out of the five. Using a technique called vacuum distillation, came a plate of Carrot Gnocchi with Ginger Flower and Carrot Broth with Pistachio and Wild stems of Fragrant Herbs. The technique creates a reduction of carrot with no heat applied, whereby only water is removed under vacuum, leaving behind only natural carrot fructose sugars and beta-carotene compounds. This method illustrates how far one single ingredient can be pushed to its limits using the age-old technique of distillation. It was also paired with Cordon Bleu. Next was Foie Gras Coulant with Spiced Wine, Cherry Cocoa and Spices. Created through sound homogenisation, the cylindrical shaped foie gras oozed out cocoa with a single cut. By passing 20,000 waves of sound per second through cocoa nibs, spice and spirit, his team created a delicate spiced blend that works well with the foie gras. The same is done to the cocoa butter and cocoa nibs which are then added to foie gras to create a new texture with a liquid surprise inside. For me, this meal was over-spiced and did not help enjoy my first taste of foie gras. The third course was paired with X.O. The dinner moved to the fourth course by providing guests with Venison with Black Turtle Beans, Dashi Emulsion and Black Radish, made using low temperature cooking. Also known as sous vide, this technique is used in many kitchens around the world, delivering perfectly cooked creative infusions. A glass of Creation Grand Extra was paired with this meal. This drink is a mark of triumph, presenting an explosion of flavours and has a powerful and intense aromatic architecture that lingers in the mouth. The dinner ended with a dessert with different textures of milk through a dehydration and nitrogen method. This added texture and surprise. The sour and sweet texture of the dessert was paired with Chanteloup Perspective. The drink provides a rare sensory experience and has a lingering taste in the mouth. In addition to the five-course gourmet dinner, the evening’s cocktails also showcased an array of innovative techniques, including electronic vaporisation and sound wave emulsification. The four unique cocktails, were all made with VSOP and created by Tippling Club’s mixologist Zachary de Git, who is renowned for adding an avant garde spin on classic cocktails. Guests were also treated to a little Sazerac variation, Dark Plum Crusta, VSOP Float, and VSOP Sour. It is the skill and vision of these craftsmen that has made the House of Martell an icon of French excellence.